So you want to do more with your love of animals? Muck out barns? Assist with running tours? Educate the public at events? Socialize with animals? If, so, we’d love to have you! Join our volunteer family today! Volunteers must be 18 and older. Reliable transportation to and from volunteer location. Animal transport: Assist our adoption efforts by transporting chickens to our Flock Partner shelters. Education and outreach: Assist with guided tours, table at off-site events, help at sanctuary events. 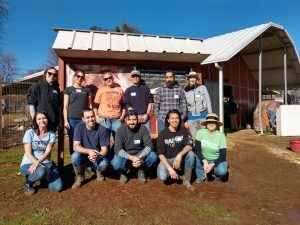 Volunteer opportunities are currently available at our main sanctuary in Grass Valley and at our vegan store in Berkeley. If your organization is looking for group volunteer opportunities, let Animal Place host your organization for a day of farmed animal fun! During your experience, you and your group will be able to learn about the history of Animal Place, help with barn cleaning, and meet our amazing animal residents! For more information and to apply, please visit the Group volunteer opportunities page.